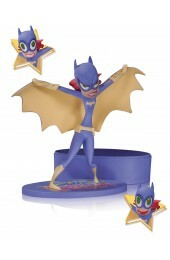 Άγαλμα Catwoman από την Diamond Select Toys από το Batman the Animated Series. Μέγεθος 23 εκατοστά (9 ίντσες). A Diamond Select Toys release! This cat has nine lives! Robbing the rich and running around on rooftops gets Selina Kyle's engine racing and now DST has captured her in the act with this 9-inch scale PVC statue! Standing atop a rooftop base with her feline friend, this PVC statue of Catwoman as she appeared in Batman: The Animated Series comes packaged in a full-color window box and will fit in with the rest of your DC Animated Femme Fatales statues. Sculpted by Steve Varner Studios!.